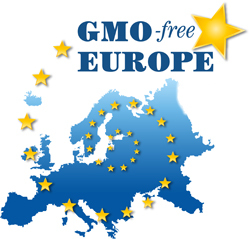 Four regions (Asturias, Basque Country, Balearic Islands and Canary Islands) have declared themselves GMO-free. The provinces of Málaga, Álava and Vizcaya as well as the Autoridades Insulares of Menorca, Mallorca and Cabildo Insular de Lanzarote declared their territory GMO-free. 117 municipalities in 14 regions have declared themselves GMO-free. In the Basque country 433 farms and 6 school allottments are declared GM-free. In 2008, more than 9 million Spaniards were living in GMO-free declared areas (out of a population of 44 million). On 2nd July 2009, a votacion took place in the Catalan Parliament on the possibility to declare Catalonia GMO-free. The proposal law was rejected. On 18th April 2009, more than 8000 people manifested against GMOs in Zaragoza, demanding to the Spanish governement a ban on GMO cultivation and food. 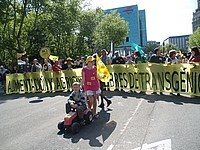 This demonstration was the culminating point of a week long of actions against GMOs. There were hundreds of actions, activities and protests all over Spain. This demonstration was organized by Plataforma Rural (Amigos de la Tierra, CAS, CECU, CERAI, CIC BATA, CIFAES-URPF, COAG,C.Tierra de Campos, Ecologistas en Acción,EMAUS, Entrepueblos, Espacio Comercio Justo, Jóvenes Rurales Cristianos, Red Africa Europa, SODEPAZ, Veterinarios Sin Fronteras, Movimiento Rural Cristiano, Mundubat,, SEAE, SOC, Universidad Rural Paulo Freire, Xarxa de Consum Solidari) and Greenpeace.